While we definitely have a passion for cruising, we also have a soft spot for airplanes, especially airplanes with a special design. In 2015 Brussels Airlines introduced Rackham, the first in a series of Airbus A320 aircraft dedicated to Belgian icons. 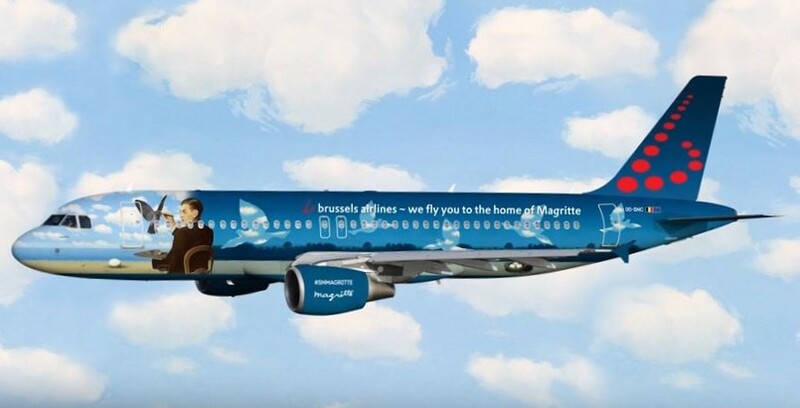 Today Brussels Airlines revealed Magritte, the second airplane in the series of airplanes dedicated to Belgian icons. “Ceci n’est pas un avion” or this is not an aircraft, or at least not just any aircraft. It is a dedication to one of the greatest Belgian artists, René Magritte. René Magritte was a Belgian surrealist artist whose work is characterised by depicting ordinary objects in an unusual context, constantly playing with reality and illusion and challenging our preconditioned perceptions of reality. On the outside, the airplane features elements from two of Magritte’s paintings, La Clairvoyance (the man painting the bird) and Le Retour (the birds filled with clouds). The cabin interior has undergone a surrealist makeover and features a flock of cloud-filled birds, taken from Le Retour and the man in the bowler hat from La Belle Société. Brussels Airlines’ surrealistic aircraft will paint the European skies for 6 years to come.